You can use the Magnet Commerce Administration Panel to add news documents to your online store's pages. For example you can use this feature to publish information that might be of interest to your customers, to further market your products etc.. Figure: Add news documents to your online store's pages by choosing "Site Content> Add News" in the Administration Panel. The first part of the "Add News" page consists of a powerful editor that will help you compose your articles in the most professional way. Please note that you will need to edit articles separately for each of the languages enabled on your online store. 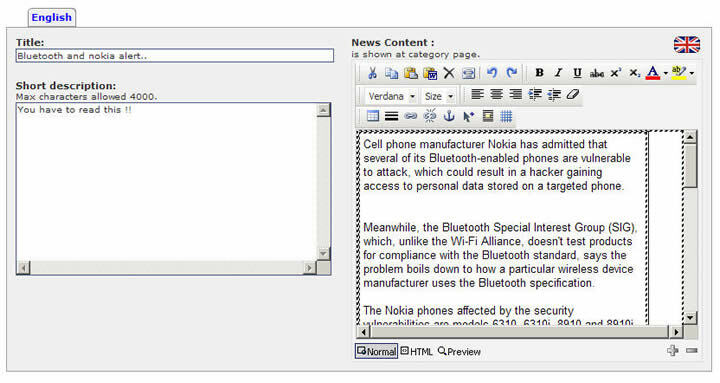 News content: Compose the article using the editor provided.  Alternatively, right clicking in the text editor box gives a menu with numerous options for inserting, text editing and formatting. For example, using the insert tab, you could insert images, videos, pdf documents etc.  You can also view or edit the html code of the article by choosing the html view button, at the bottom of the editor, and check the article layout using the preview button. Figure: Add images and publish a document. Categories: Select the categories under which the current article will be listed. Select All Categories: Tick this box if you want the article listed on all pages of your e-store. Valid From -To: Define the period for which the article will be published on your online store. Image: Upload an image for your article. This will appear right under the article's title. Update news: Click this box to publish the article on your online store. Once published, your document will get listed on the pages of your online store as you have defined. The title of your document will link to the full document page. Figure: News document listed on your store pages. The title of the document will link to the full document page. Go to "Site Content > Add News" in the Administration Panel to add news documents to your e-store. In the "Add News" page you will find a powerful editor for composing and options for publishing news documents. When you have finished setting up your article press the "Update News" button to publish it to your online store.